Officer Adley Shepherd's discipline will be reduced to a 15-day suspension under Tuesday's ruling, which also ordered the officer be reinstated to a new assignment and receive full back pay, less the unpaid days for his suspension. A Seattle police officer who was fired for punching a drunk, handcuffed woman in the face after she kicked at him during a June 2014 incident captured on patrol-car video must be reinstated to his job with back pay, an arbitrator has ruled. “(T)he penalty of discharge for Officer (Adley) Shepherd’s offense, after taking into account the various mitigating considerations, was excessive,” according to the 35-page written opinion and award by arbitrator Jane Wilkinson issued Tuesday. Shepherd’s discipline instead will be reduced to a 15-day suspension under Wilkinson’s ruling, which also ordered the officer be reinstated to a new assignment and receive full back pay, less the unpaid days for his suspension. The decision by Wilkinson — the neutral party of a three-member police Disciplinary Review Board — effectively broke a tie on determining whether Shepherd’s discipline was just. The panel included one member appointed by the city (Assistant Police Chief Lesley Cordner) and one member appointed by the Seattle Police Officers’ Guild, or SPOG (Officer Suzanne Parton). Dan Nolte, a spokesman for City Attorney Pete Holmes, said Tuesday that Wilkinson agreed with the city’s position that Shepherd had used excessive force that warranted significant discipline, but disagreed with the city’s decision to fire him. Shepherd did not immediately respond to a request for comment Tuesday. “Officer Shepherd, in an attempt to stop the woman from further assaulting him, punched the woman once,” the union’s statement said. But a lawyer for Miyekko Durden-Bosley, the woman whom Shepherd punched, disputed that account and called the arbitration ruling disappointing for several reasons. 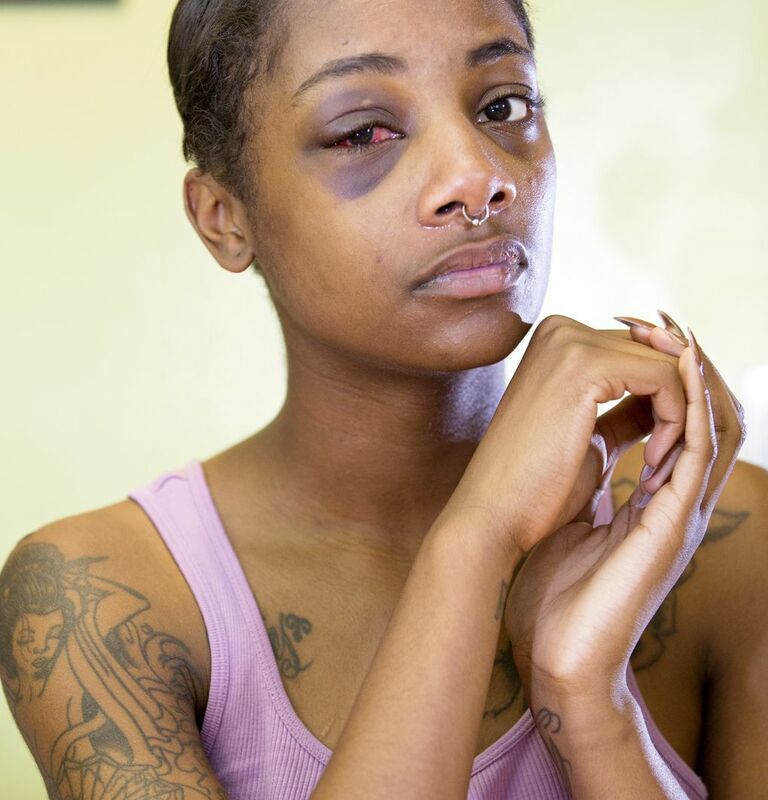 Attorney Tomás Gahan said not only was Shepherd’s arrest of his client “baseless,” but the officer was “an experienced boxer” who punched Durden-Bosley while both of her hands were cuffed behind her back. The punch broke her orbital bone, Gahan added. Durden-Bosley, then 23, was intoxicated and verbally abusive during the incident outside the home of a Seattle man whose mother had called the police. Shepherd, the first of three officers to arrive at the scene, ultimately told her and the man he was losing his patience with their contradictory explanations. “Somebody’s going to go to jail, who’s it going to be? Eeny meeny,” Shepherd told them. After Shepherd arrested Durden-Bosley for investigation of domestic violence, she swore at Shepherd and kicked at him while he shoved her into the back of the patrol car. “She kicked me,” Shepherd shouted, before punching her. “It was uncontroverted that Ms. Durden-Bosley’s kick landed in Officer Shepherd’s face and she was wearing Doc Marten brand boots,” according to a summary of the evidence reviewed during the appeal. Shepherd and Durden-Bosley were both treated at Harborview Medical Center. Durden-Bosley was later taken to jail and spent four days there before the case was dismissed. Durden-Bosley filed a civil lawsuit over the incident, settling with the city for $195,000 in 2016. The sum included her attorneys’ fees. Leaders of the NAACP in Seattle criticized King County prosecutors for not bringing a felony assault charge against Shepherd, likening the case to the deaths of two black men, Eric Garner in New York and Michael Brown in Missouri, and the decisions of grand juries not to indict white police officers for their killings. Shepherd is African American, as is Durden-Bosley. The Office of Police Accountability (OPA) conducted an internal investigation after county and federal prosecutors declined to press charges against Shepherd, who was placed on paid leave shortly after the incident. Shepherd, 42, was fired in November 2016 after then-Police Chief Kathleen O’Toole found he had violated department policies regarding use of force and de-escalating confrontations, according to a termination report. “OPA concluded, and I concur, that the employee’s conduct was in stark contrast to the expectations set forth for our officers, and particularly our heightened duty of care to those in our custody,” O’Toole said in a statement posted on the department’s website. In her report, O’Toole wrote that Shepherd’s punch of the woman while she was inside a patrol car violated department policy requiring use of force to be reasonable, necessary and proportional. The police union appealed Shepherd’s firing, contending the city didn’t have just cause to fire him. The guild also alleged that O’Toole’s decision may have been politically motivated, that the chief didn’t thoroughly review the matter and that she made erroneous assumptions. During Shepherd’s post-termination hearing, the review panel heard from various witnesses and watched police video of the incident over several days. Cordner, the city’s appointed member, strongly agreed with Shepherd’s firing, while Parton, the police guild’s member, disagreed with that discipline. Wilkinson, whose selection to the panel was agreed upon by both the city and the union, ultimately decided the matter. Nevertheless, the city cannot “eschew the just cause considerations” that are part of its collective-bargaining agreement with the rank-and-file officers union, Wilkinson found. Instead, the city and SPOG were ordered to confer and agree on a new, suitable assignment for Shepherd, the ruling said. News researcher Miyoko Wolf contributed to this story, which contains information from Seattle Times archives.